Last month, I finally got to “use” a present I got at Christmas. That present was weekend reserved grandstand seat tickets to the British Formula 1 Grand Prix at the Silverstone Circuit and I took my dad with me. Those that know me will know that I’m a fan of F1 and going to a F1 race weekend was an item on my bucket list. That item can now be crossed off and what a brilliant weekend it was. As well was watching the millions of pounds cars race around the track on the Sunday, we also got to see the GP2, GP3 and Porshe Super Cup. This also included the free practice and qualifying sessions. There was plenty to see and with the tickets that we had, we were also able to go and sit in other grandstands on the Friday and Saturday. On race day, our seats were situated at the end of the pit straight, looking towards turns 1 and 2 where there’s usually lots of action as the cars jostle for position from lights out. We had good views of the start, once we managed to climb on top of the seats as everyone in the stand stood up. All the cars made it round the first few turns. But we wouldn’t see a full first lap from all the cars as there was an accident about half way round, Kimi Rikannen crashed his car into the barrier and took Felipe Massa with him. This meant that the race had to be stopped whilst they recovered the cars and make repairs. An hour later the race restarted behind the safety car and we had the rest of the cars racing for 52 laps. 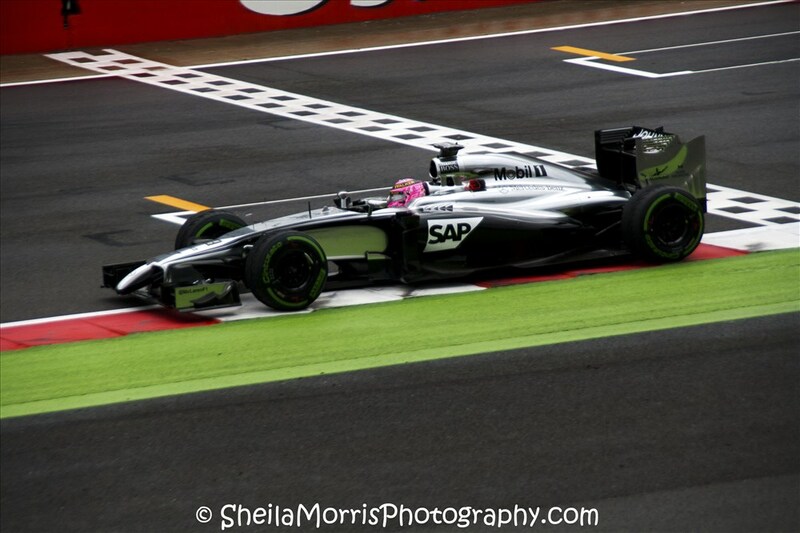 This photo of Jenson Button was taken on the Saturday during one of the 3 qualifying sesssions, where we were sat almost directly opposite the start/finsh line. As you can see from the photo, the weather was a tad bit wet. This made for interesting driving where we saw one car spin down the pit straight, just missing the wall, and cars getting a bit twitchy coming round the last corner. Jenson Button wore a special helmet for this race weekend. This pink helmet was to celebrate the life of his father, John Button, who sadly died at the start of the year.